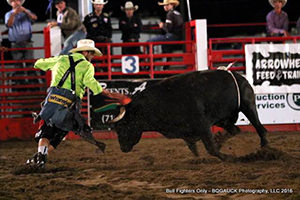 BURLINGTON, Colo. – Ross Johnson was excited just to be part of the Bullfighters Only tour stop Friday night in conjunction with the Kit Carson County ProRodeo. He did it one better with an 86-point freestyle bullfight to win the title. “Whenever Cory (Wall) called me and asked me to come up there, it was a big honor,” said Johnson of Merit, Texas. “Then he talked to us and said it was a BFO-sanctioned event, so that made it even bigger. To win it is just icing on the cake. A bullfighter for less than six years, there were lots of benefits to doing well in Burlington. Not only did Johnson collect $3,000 for the win, he also got to show off his talents before a great crowd and a bullfighting legend in Wall, who organizes the annual rodeo in his hometown. “It means the world to have Cory see me fight or have anybody with that big of a name in rodeo,” Johnson said. “It’s a blessing to have a night like that. As a retired bullfighter, the bullfights get him pumped up, too. A big portion of his fun came in the form of a solid fight. “When I called for the bull, I could tell he was definitely the ace of the group of bulls we had,” he said. “I did draw good; he was on me the whole time, and he kept pushing me. As he gains more experience, Johnson will utilize his instincts and ability more. He hopes it carries him on to greater things in his career. “Right now, I do some day work and fight bulls, but I want to be able to do this and not have to worry about having a typical job to make ends meet,” said Johnson, 23. “If I could do this full time, then I’d be living a dream. He definitely has the right attitude.